SUBHEAD: As public resistance mounts, the TPP is becoming the 2016 election's "third rail". 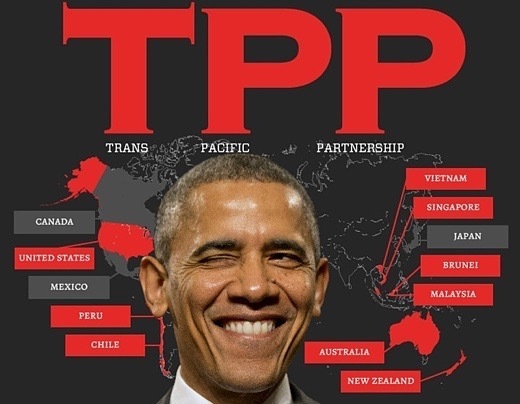 Image above: Illustration mashup of Obama and chart of TPP participants. From (http://beforeitsnews.com/opinion-conservative/2016/02/obama-signs-trans-pacific-partnership-3100956.html). So there you have it: It is all about corruption, and this is about as unadulterated as corruption gets in our hallowed democracy, other than literal cash under a literal table. These are the people whom Obama needs to pass this agreement, and the window between Nov. 9 and Jan. 3 is the only time that they are available to sell their votes to future employers without any personal political consequences whatsoever. The only time that the electorate can be rendered so completely irrelevant, if Obama can pull this off. But that is still a big "if," because we still have elections, and Obama has to consider what his campaign to pass the TPP will do to the Democratic Party—or at least he should. On the other side, he has most likely gotten the message that a failure to go all-out for the TPP would cause some big money to shift from the Democratic Party to the Republicans. The most powerful corporations in the country, as well as many actors in the "national security state," want this agreement very badly. It is a coalition of everybody who is anybody.